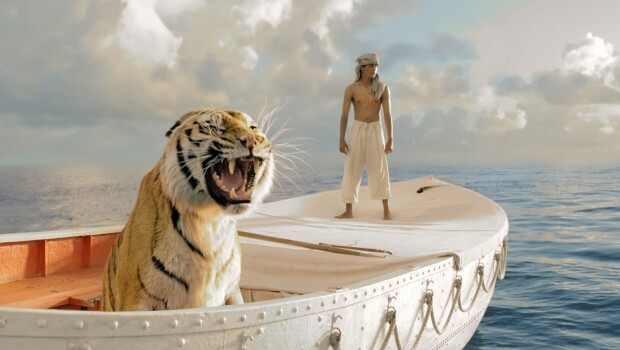 Suraj Sharma and a fierce Bengal tiger named Richard Parker are seen in the movie "Life of Pi." Regardless of whether it has that effect on audiences, Catholic moviegoers will certainly welcome its positive portrayal of their faith, and the presence in the tale of a sympathetic priest. The fact that the earnest spiritual quest of its protagonist results in his simultaneous adherence to Hinduism, Christianity and Islam is, however, problematic to say the least. All the more so, since screenwriter David Magee’s script implicitly upholds this ultra-tolerant but illogical stance. Concern over youthful viewers’ reaction to this interreligious will-o’-the-wisp is the major element precluding endorsement of Lee’s picture for any but adults. And just who is our main character? Played in adulthood by Irrfan Khan but portrayed for most of the running time in his 17-year-old persona by Suraj Sharma, he is an Indian-born Canadian known formally as Piscine Militor Patel — but called Pi for short. As flashbacks under the guise of memories being shared with the unnamed — and unbelieving — journalist reveal, Pi was bred in the picturesque former French enclave of Pondicherry. Growing up contentedly amid the natural beauty of the area, Pi was fascinated by the wondrous creatures that inhabited the zoo his parents (Adil Hussain and Tabu) owned. Discovering God in varied manifestations during the initial stages of the quest referenced above, Pi also made a less exalted discovery by falling for a local girl. So when Mom and Dad announced, shortly afterward, they were moving the family to the Great White North, Pi was crushed. Upheaval turned to tragedy when the freighter carrying Pi’s family — as well as some of the animals from their former zoo — sank in a terrible squall. Pi was the only human survivor. But his endurance was immediately put to a further test when he found himself forced to share a small lifeboat with a Bengal tiger. Not for the impressionable or the poorly catechized, this psychological parable, whose meaning cannot be explained without spoilers, also becomes somewhat taxing as the rigors of the lad’s unusual ordeal begin to rub off on viewers. Aesthetic judgments will likely hinge on the degree to which audiences summon the hardiness necessary to follow Pi’s adventures through to the end. Assessed from a religious perspective, his fictional memoir registers as honorable but ultimately somewhat misguided. The film contains a complex treatment of religious faith requiring mature interpretation, potentially upsetting scenes of life-threatening danger and animal aggression, some mildly vulgar wordplay and fleeting scatological humor. The Catholic News Service classification is A-III — adults. The Motion Picture Association of America rating is PG — parental guidance suggested. Some material may not be suitable for children.